All transactions are safe and secure with a reliable history in online purchasing behind each of our associates. 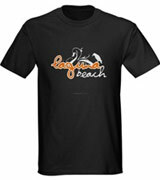 Buy the Laguna Beach Orange Logo t-shirt to own Laguna Beach clothing and merchandise. The orange and white Laguna Beach logo looks sharp against the black fabric of the tee. Perfect for both guys and girls, the design features a white bird-like silhouette behind the show's name. Another smaller bird rests on the letter 'a' at the end of the word "Laguna." This tee is perfect for a beach bonfire with friends, or a casual stroll in the sand with your significant other. The design is equally attractive on a navy MTV Laguna Beach t-shirt. In addition to the Laguna Beach Orange Logo tee above, browse the Laguna Beach Clothing Gallery for more apparel like men's and women's clothes, kids shirts or hoodies.